The Pitch Grid chosen sets a "ladder" of frequencies to which notes can be tuned. 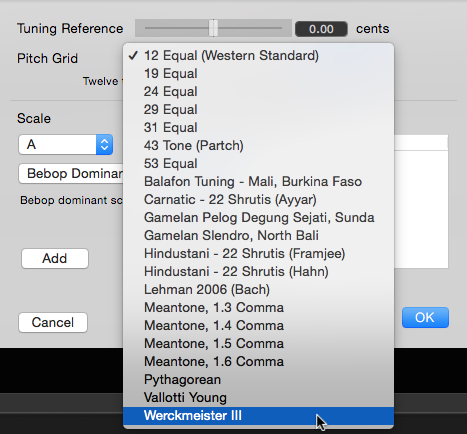 These are based on a variety of scale tuning standards, 12 note equal tempered at the top, then microtonal scales, World Music scales such as Gamelan and Hindustani, and historical temperaments at the bottom. If you select one of these and return to an expanded track display, displaying "All Notes", perhaps zooming the pitch resolution in our out to see clearly, you will be able to see the vertical gradations of the pitch "ladder". The microtonal tunings have a lot of increments, as the pitches are close together, whereas the Gamelan tunings only have five intervals per octave, as they are pentatonic by nature. It follows that only certain of the "Active Scales" will be relevant in the case of, for example, pentatonic tunings, and even if you select a Bebop Minor scale for that pitch grid it will not display properly or at all, because the correct intervals are not all available. If you try to superimpose a western scale on a microtonal pitch grid, for example, the system will do its best to map the notes of the scale to the pitch grid. The scale grids set up are relevant when dragging pitch blocks up or down in parts of the application where this is possible (e.g. Manual Warp), or when using the Correct Pitch tool. When the pitch of blocks is corrected using either of these processes, they will "snap" to the intervals of the pitch grid (when dragging, only if the option or alt key is held down). Any original pitch offset of a block from recognised notes of the scale will be maintained during this process, so a note that was say 4 cents sharp to begin with will snap to the grid with that offset.